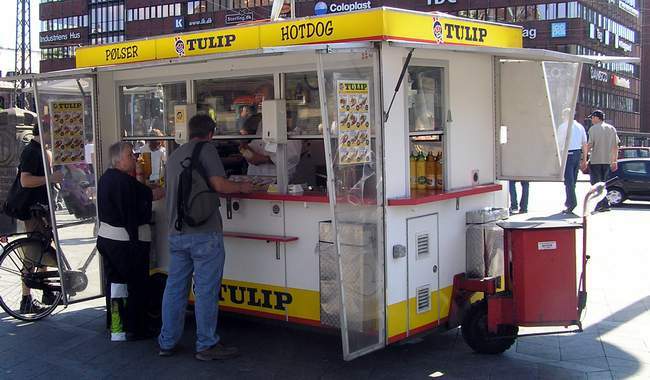 The most common street snacks are found in a pølservogn (which could translate as "weenie wagon"). Danes love weiners; hot dogs, sausages, wursts, served with various condiments, roasted onions, cucumber slices. But the standard lunch in Denmark is smørrebrød, those famous open-faced sandwiches on danish dark rye bread, layered with all sorts of pålæg. You'll find smørrebød on the table every day in danish homes, in expensive resturants, or in the cheapest take-out food shops. Then there's sild, or herring. You can get that little fish a hundred ways, traditionally served with snaps to give it a little kick. Several snaps will kick your feet out from under you, it's 45% alcohol. Beer, called øl, is definitely the main alcoholic drink, and it's a culture for itself. You've probably heard of Tuborg and Carlsberg, but there are a lot of other smaller breweries that enjoy hero status. Danes drink lots of beer, and you'll be expected to participate. As for sweets, the most common is Wienerbrød, the pastries you can get in bakeries. Americans know what a "Danish" is, although I've never seen one over here, which is sort of the same, only freshly baked and never wrapped in cellophane. But although quite delicious, the danish pastries are rather specific; what you can't get over here are donuts, real pie, angel food cake, most of the stuff I was used to in the States. Just as well (sigh). Otherwise you can find pretty much everything here you can anywhere else. When I first came to Danmark in the 60's there was only dansk mad, but now it's totally international. 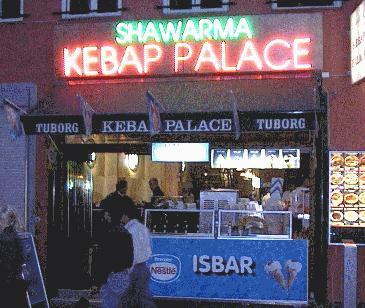 Most common are pizza parlors, chinese grill bars, and Arabic Shawarma shops. There are sizeable communities of Indians, Pakistani, Turkish, Jugoslavs, so those resturants have been established for quite a while, as have most European variants like Spanish or Greek. A few years ago the first Mexican resturants began to show up, and now there is a wave of Thai resturants popping up all over town. Who knows what's next? The Arabic/Turkish places are usually good & thrifty places to eat, French and Balinese cuisine are on the high end, if you want, and can afford it. And of course, American Imperialism has conquered Denmark along with the rest of the world. McDonald's are everywhere now, and as you can see below, the 7-11's, Burger Kings & Kentucky Fried Chickens are not far behind. And you can drown in Coca-Cola, for Kbh is a civilized place where old world standards are maintained--Fast Food Lives! The classic smørrebrødsandwich is a leverpostejmad, danish paté / liverwurst on that special dark rye bread, with a beet slice, or cucumbers, and it's really rather tasty. But the variation is enormous; you can get smørrebrød with meat or fish or shrimp laid upon it, eggs, cheese, cod roe, a potato slice, garnished with a twist of lemon, even--yes, really--chocolate. A Shawarma is sort of an Arabic taco, grilled lamb chunks in pocket bread, dressed with lettuce & sour cream & chili sauce. Really good, try one. Most Mexican Resturants in Kbh aren't very authentic--they're good, but not what you expect. However, fellow American Kevin has established "the Taco Shop"--and it was so successful that he has 3 of them now. These serve real Cal-Mex stuff: tacos, burritos, chimichangas, best in town by far. They are also true "American hangouts", where everybody speaks english--even the Danes, who are happy to get the chance to.